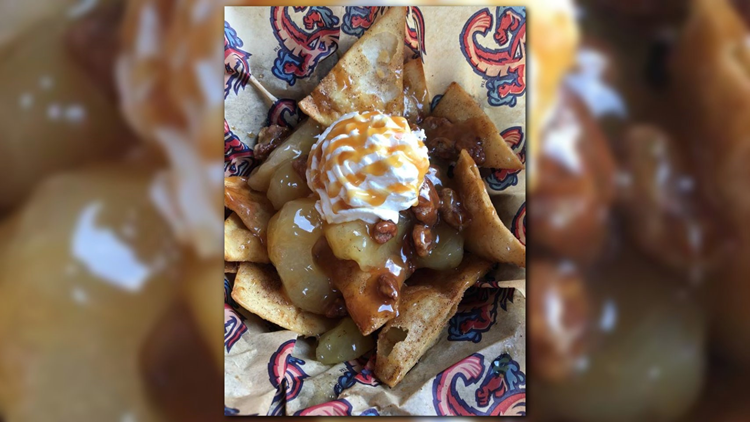 The Jacksonville Jumbo Shrimp is debuting a new menu item and it's as American as apple pie... nachos.It's apple pie nachos. The Jacksonville Jumbo Shrimp is debuting a new menu item and it's as American as apple pie... nachos. They will be available beginning July 3 at the All American JAX concession stand for just $8. First Coast News got a sneak peek and taste at the new menu item and they were gone faster than you could round third base. The nacho portion is a deep-fried piece of thin dough with cinnamon on it. On top of that is a sticky apple compote, candied pecans and a dollop of whipped cream. They're warm, they're cool and you definitely want to try them while you cheer the Shrimp on! Also if you're seeing the Shrimp on July 3, the first 2000 people will get a free patriotic hat!